Jennifer Manchester has a passion for working with people and providing creative solutions to what may seem the impossible. This dedication has earned Jennifer "Charlotte Magazine's 5 Star Best in Client Satisfaction Customer Service Award" every year since 2009. 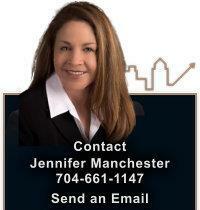 Whether you are looking to buy or sell your home in Mint Hill, Matthews or the surrounding suburban areas of South Charlotte, Jennifer's knowledge of the local real estate market and expertise in home staging can help you make the decision that is right for you and benefit you well into the future.